It’s the trip of a lifetime. You’ve read about the Rainbow Lorikeets and the Lorimakos in New Zealand and even though you’re relatively new to bird watching, you’ve planned a 10 day birdwatching adventure to the land of Kiwis. Shortly upon arrival, you’re guide takes you to the best possible location for viewing Crimson Rosella’s and you reverently position yourself for an exciting glimpse. Too bad your binoculars aren’t as good as you thought and all you can see is something that resembles a colorful ball of fuzz. The right optics can make a world of difference in your bird viewing experience. 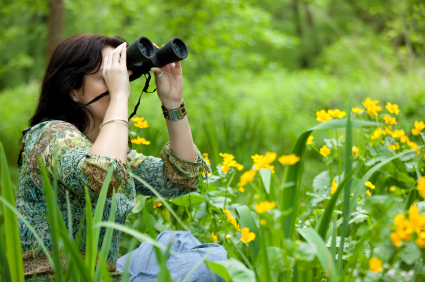 Good binoculars will allow you to see feather details as well as identify birds from hundreds of feet away. While you may not want to spend several hundred dollars on a good pair of binoculars, keep in mind that the $60.00 field optics equipment you’re considering probably isn't going to offer the quality viewing experience that more expensive binoculars would. Binoculars are available in a wide variety of sizes, shapes and specifications and are used for a variety of purposes ranging from sporting events, star gazing, hiking, etc. Because binoculars have a large light-gathering capacity and the lenses are spaced wider than the human eye, images are brighter, more detailed and more three-dimensional than normal vision. Unfortunately, there’s no one perfect binocular that will fulfill all of your viewing needs. In most cases, you’ll have to compromise certain features and specifications. Only a few binocular models offer the best value with regard to optics, construction, performance and support . For these reasons, it’s important to carefully consider your primary use for binoculars before you purchase them . Consult with other birders to get their input and browse birding web sites for helpful information. Additionally, consider investing in a pair of EyeShields from Field Optics Research. EyeShields attach to your binoculars, blocking out glare, ambient light, wind, dust and other distractions so you can you concentrate on bird watching with enhanced clarity and enjoyment.